We in the Anuak Justice Council (AJC) call on President Salva Kiir and all others in his government to not only provide safety to the Anuak from South Sudan, but to defend and protect the rights of Anuak whose indigenous land lies on both sides of the river. Press Release (Vancouver, BC, Canada)— We the Anuak Justice Council (AJC) are highly disturbed by reports that the new government of South Sudan is cooperating with the Ethiopian government in returning seventeen Anuak from the Alari Refugee Camp in Pochalla County back to Ethiopia where they are certain to face imprisonment, torture and maybe death under the dictatorial leadership of Meles Zenawi. This is a violation of international law concerning refugee rights and a shameful betrayal of the Anuak who fought for the freedom of the Southern Sudanese people and for an independent country of South Sudan. Since the massacre of the Anuak in December of 2003 by the TPLF/EPRDF security forces, most all of the horror, pain and suffering that the Anuak have been enduring has been coming from the Gambella region of Ethiopia. Now, we are dismayed to hear how the stretching reach of the Meles regime has crossed an international border to become deeply involved in the affairs of South Sudan. Southern Sudanese should take this as a threat to their national security. From our sources, the AJC has learned about a plan, allegedly supported by the Ethiopian Embassy in Juba, which involved bribing some public officials within South Sudan so as to allow the Meles regime to fly a small private jet to Pochalla County in Jonglei State to pick up seventeen Anuak at the refugee camp, fifteen who have been accused of being rebels in Ethiopia and two who are believed to be TPLF/EPRDF security officers. These men were flown to Juba and placed in detention on the weekend. 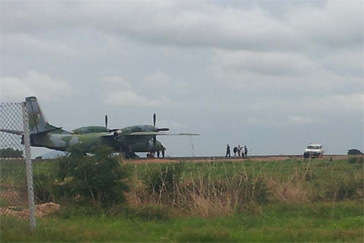 After UNHCR in Juba was alerted, it was planned that they would be questioned this coming Thursday, May 24, 2012, to determine whether they were really refugees or not; however, before that could take place, an Ethiopian air force helicopter arrived at the airport in Juba and the men were rounded up and taken from the maximum security center where they had been held without going through the proper channels. As arrangements were made very quickly to expedite their departure for Ethiopia, the AJC received word from sources on the ground that the men had already been loaded onto the Ethiopian Air Force cargo plane and had been chained. Before the Air Force cargo plane could leave, the information was shared with authorities at UNHCR who were shocked that these clandestine arrangements had been made behind the scenes. UNHCR contacted the South Sudanese authorities to put a hold on the flight. Ethiopian Air Force cargo plane remained on the tarmac for more than six hours while negotiations were going on. According to sources, those involved included South Sudan security, Ethiopian security, the Ethiopian Embassy and UNHCR. Finally, after no agreement was reached, it was ordered that the seventeen Anuak should be returned to detention until today May 23, when continued discussions would take place. The TPLF/EPRDF regime reportedly paid for the small private jet that originally picked up the seventeen Anuak in the Alari Refugee Camp and brought them to Juba. Had they not been stopped because of leaked information to UNHCR and Upper Southern Sudanese leadership, these detainees would have been returned without any discussion. How could a foreign government get away with doing this in another country? This is worth investigating and anyone found to be complicit with this should be punished. The Meles regime, a regime known for its corruption—11.3 billion disappeared since 2000 due to bribes, money laundering and export mispricing—should not bring their corruption to South Sudan. On what or whose authority was this plan executed? Southern Sudanese officials on the top, like President Salva Kiir, may not have known what was transpiring on the ground, with the assistance of the Ethiopian Embassy, until the plan was nearly executed. Jonglei State, especially Pochalla County, where most Southern Sudanese Anuak live, is becoming the unmonitored playground for TPLF intelligence. Already, there are accusations that these TPLF regime representatives bribed the local people. The TPLF regime’s motive is their fear that Anuak rebels are hiding out in Sudan and launching attacks against the TPLF/EPRDF troops or interests in Gambella where they have been forcibly evicted from their land. Those who have spoken out or resisted have become victims of violence or other punitive repercussions. The government of South Sudan should be very wary of the actions of the TPLF/EPRDF regime due to their actions against their own people as well as their disregard for international laws. Numerous reports, including this one, indicate that TPLF troops and/or intelligence officers are entering into South Sudan carrying guns across an international boundary line without permission and with an arrogance that has already undermined the national integrity of South Sudan. This should be investigated as such actions are a clear violation of sovereignty. According to our sources, last week an incident occurred when the TPLF sent two pro-government security intelligence officers of Anuak ethnicity to the Alari Refugee camp to assess the situation. This camp still is home to thousands refugees who remain there following the genocide of 2003 in Gambella. Now, these security agents have entered into South Sudan with no papers, with weapons and with the distinct goal of interfering with internal South Sudan policy matters and violating international refugee asylum laws. Two days after they arrived, there were incidents of shooting between the South Sudan police and some of the accused Anuak insurgents. The details are not yet clear, but we know there was fighting between the two groups, including the TPLF agents, and that four Anuak were killed in the skirmish. Four others were arrested along with the two Anuak security officers sent by the Ethiopian regime. Together, these six men were transported to Juba on Saturday by the afore-mentioned chartered jet, paid for by the Ethiopian Embassy in Juba. On Saturday, in Boma in another part of South Sudan, eleven other suspected Anuak insurgents were arrested. Again, a private charter jet funded by the Ethiopian Embassy brought them to Juba. This information reached to the Anuak Justice Council on Saturday at which time we began to monitor the situation. TPLF/EPRDF regime is known as one of the worst perpetrators of human rights crimes in Africa, including serial incidents of genocide, crimes against humanity and other gross human rights abuses. Torture and other atrocities are a part of this trademark of this regime. We know that now that Ethiopian Air Force cargo plane took off at 12:43PM today back to Ethiopia without the seventeen men. We did not hear where about these men are. We hope they were not returned or will never be return to Ethiopia where it is likely that they will be tortured and possibly killed. Can South Sudan become an ally to the TPLF without carefully calculating how to ensure this new country maintains its integrity, values and purposes? Can the Republic of South Sudan allow the friend of South Sudan’s previous enemy unhindered access to this new and fragile country? Omar al Bashir is a friend to Meles. His regime is responsible for the deaths of over two million of our Southern Sudanese people. Bashir’s government is still a threat to South Sudan as they continue to threaten aggression at the border. Bashir recently called the beautiful people of South Sudan, “insects.” Meles’ government remains a threat to the Anuak and Ethiopians throughout that country. Meles and Omar al Bashir just recently signed an agreement to extradite “refugees” or “criminals” of either country to the other; yet, in Ethiopia, a “criminal” may simply be a political opponent, an advocate for justice, a non-party member or someone from another tribe. Additionally, for those who are arrested or charged, the TPLF/EPRDF regime has utilized many scapegoats and never been careful to ensure that the ones they arrest and punish are actually the ones who committed the crimes. In light of this, we call on President Salva Kiir , the government of the Republic of South Sudan, the people of this country as well as the Red Cross and the UNHCR to follow up on the fate of these men to make sure they are not taken to Ethiopia where they will be killed, tortured or disappear. The mandate of the Anuak Justice Council is to defend and protect the rights and well being of the Anuak, wherever they are found, but especially within their homeland which is the Jonglei State of South Sudan and the Gambella region of Ethiopia. This new country of South Sudan is celebrating their freedom after decades of war and sacrifice. We Anuak have contributed to that struggle. Even within the Anuak Justice Council there are many of us within the organization who have fathers, brothers or other relatives who have sacrificed and died to bring freedom to this new country. Even the current chairman of the Anuak Justice Council’s youngest brother fought in the SPLA and was wounded as he paid a price for the freedom of South Sudan. How then can South Sudan consider turning over our loved ones to an enemy regime where they will never find justice, whether innocent or guilty. We Anuak did not die for this country to be handed over to another strongman who believes he can walk into South Sudan like he has every right to be the bully in his neighbor’s yard. We Anuak are not speaking as outsiders, but as citizens of this country. Southern Sudan does not border the Tigray region of Ethiopia like it does with the Anuak who live on indigenous land in both Ethiopia and South Sudan so why should South Sudan become the playground of the ethnic apartheid TPLF regime? In closing, we in the AJC call on President Salva Kiir and all others in his government to not only provide safety to the Anuak from South Sudan, but to defend and protect the rights of Anuak whose indigenous land lies on both sides of the river. The Anuak of Ethiopia gave refuge to the Southern Sudanese during the long civil war; often walking many miles carrying water, food and clothes to greet the weary Southern Sudanese as they were seeking refuge near us in Gambella. Do not give us reason to doubt your allegiance to all the values of a free society. More specifically, do not give preference to a brutal, corrupt and autocratic regime who divides its citizens based on ethnicity and who has no respect for its own people. In Ethiopia, the Anuak land is being given away to foreign investors and the people have been forced off their land. They are being persecuted, killed and now when they want to find a safe place for refuge, they are now being threatened, arrested and handed over to the same regime that has been killing them. It is appalling and unconscionable. We ask that South Sudan launch a thorough investigation into what has happened and who is behind it. Those who are complicit should be punished. The AJC will do all it can to make sure that the well being of the Anuak are protected, including sending a delegation to South Sudan to meet with President Salva Kiir personally to make sure that the rights of the Anuak are protected and that the Anuak do not fall victim to continued injustice. We hope that your future policies will be in greater alignment with the values of a free society because this new country of South Sudan came at great cost and it should not be the cause of more death, pain and persecution against the Anuak or any other people. We, Southern Sudanese fought for something better than this and we trust that you will be an advocate for freedom for all the people of Southern Sudan, the people of Africa and for humanity as a whole. May God bring justice to our land and to all our people!